The Orpheus’s reputation continued to grow in the years leading up to the Second World War. There are 26 choristers in this photograph, taken in 1938, a year before the outbreak of the Second World War. The War Years and Beyond. When war broke out, men throughout the country were sent away to fight. However the choir’s membership was not badly affected by the War. This was because - not surprisingly - many of its members were working in the furniture industry. With the start of hostilities, many local firms were earmarked to participate in the war effort, particularly aircraft manufacture. Those employed in this industry were deemed to be in ‘reserved’ occupations and exempted from war service. However, choir membership was not totally unaffected, and a slight decline occurred. Early concerts had a classical and deeply religious theme, and performers of national reputation were frequently engaged to participate. 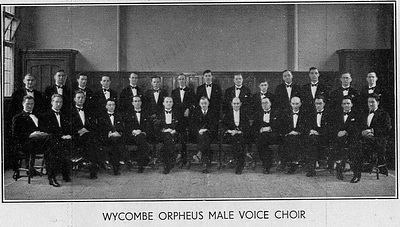 Slowly, and in particular in the years after the war, the Orpheus repertoire started to evolve to become more varied, covering the whole spectrum from highbrow to ‘Pop’. Now, wherever possible, local talented singers and musicians are showcased. 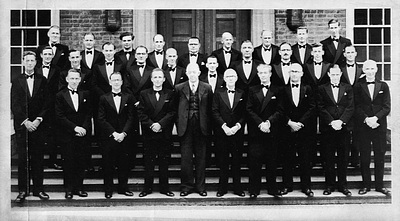 This photograph was taken in 1951 showing the choir strength at 28. It is interesting to compare the pre and post-war numbers.